I let this lensblography lapse a while; it seemed no one was reading it. But apparently a few are! So on we go. My sixteenth lens, Funny Signs and Bizarre Billboards, was created on July 6, 2007. It’s a photo gallery of funny billboards, church signs, shop notices and other weird signs. One of my favorite websites at the beginning of the web, funnysigns.com, hadn’t been updated in years. (It now redirects to a new LOLcats/FAILblog style website.) I wanted to carry on the tradition. Also, my Mom keeps sending me photos of funny signs. 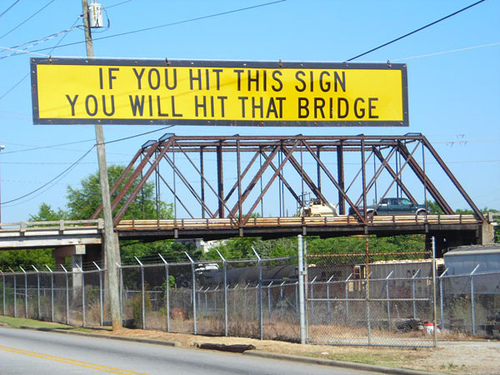 So I scoured Flickr for Creative Commons photos of funny signs, and featured the best. I also featured my Mom’s photos, and a few of my own. How NOT to do on-page optimization! That meant DOZENS of graphics all with the key phrase “funny sign” in their file names and titles. Over and over and over. According to studies I’ve seen since, it actually takes a lot of keyword repetition in the body text of a webpage to incur the penalty, but apparently I tripped it. Google dropped the page like a rock. A rock with poop on it. In June of 2010, I repaired some of the damage, added more signs (which I do from time to time), and added page breaks, which means multiple pages pulling in traffic instead of just one. The lens has never totally recovered from my screw-up. And in fact, today, I think I’m going to take a big risk and rename the graphics again. But THIS TIME, I’m saving COPIES of every single module before I tinker with it! Don’t screw with a successful lens. Or, if you do tinker, save a copy of everything before you start messing with it. People love galleries of funny pictures. The problem is optimizing so your page stands out from all the OTHER galleries with funny pictures. As of today: Lensrank #771, 60 ratings, 18 favorites, 8,993 lifetime visitors. Best lensrank achieved: #408. Lifetime earnings: $149.04. My fifteenth lens, George MacDonald’s The Golden Key, was created on June 30, 2007. It’s an e-text of one of the best children’s books ever written, George MacDonald’s The Golden Key, illustrated with my own drawings. There was a boy who used to sit in the twilight and listen to his great-aunt’s stories. She told him that if he could reach the place where the end of the rainbow stands he would find there a golden key. 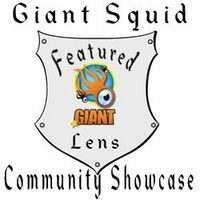 When I started on Squidoo in 2007, before we had lensographies, blogs, Twitter, Facebook fan pages, or even Squidoo co-brands, lensmaster Jack C. Lee proposed a great idea: Squidbooks, using Squidoo to publish books. 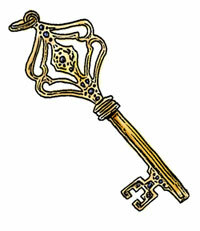 Meanwhile, I’ve had a lifelong dream: to produce an electronic, illustrated edition of George MacDonald’s The Golden Key. Published in 1871, exactly 100 years before I was born, it’s my favorite children’s book, and its copyright expired long ago. So I actually went to the UCLA library, found an original edition, and typed the whole thing into my laptop. A Squidbook isn’t the best way to present such beautiful material, especially since Squidoo has a lot more ads and garish graphics than it did back then. But this project is still dear to me. Squidoo is a difficult medium for long content. It was even harder back then, when text modules were limited to 2000 words, and we had no page breaks. That’s probably why the Squidbooks idea died out. A few people have tried to revive it and failed. Illustrations take time. This is obvious, but it explains why there are so few hand-drawn pictures on the web. I’ve only done a few illustrations, and I’m only satisfied with three of them — I’m not a great artist. Realistically, unless you’re a professional artist, you’ve got to use stock photos, creative commons and clip art for your Squidoo graphics. Nonetheless, my traffic stats show there is a constant demand for free e-texts, “children’s books like Harry Potter,” and reading material. If you could figure out the right way to package a Squidbook, you’d be golden! Of course, the right way is probably to publish on Kindle and make a Squidoo lens promoting it. Obviously, it’s better if a Squidbook or ebook is your own, original work, but there’s some value in resurrecting ancient 240-year-old-books, letters, and other antiques where the copyright has lapsed. In fact, you should check your own family stores for any special letters — World War II letters, for example — or old books worthy of a lens. As of today: Lensrank #68,061, 7 ratings, 2 favorites, 660 lifetime visitors. Best lensrank achieved: #2738. Lifetime earnings: $5.35.